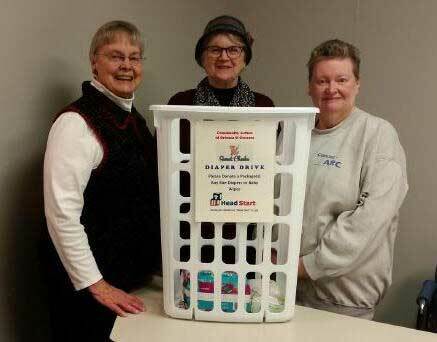 Provided photo: Community Action Board members organizing and supporting Sweet Cheeks Diaper Drive include from left: Esther Leadley, Barb Shine and Debbie Miller. April is nationally recognized as the “Month of the Young Child” to emphasize the unique needs and rights of young children and their families. In response to the Month of the Young Child, Community Action of Orleans & Genesee’s Volunteer Advocacy Committee is sponsoring a “Sweet Cheeks” Diaper Drive to assist in meeting the ongoing needs of Community Action’s Head Start program for young children. The Head Start Program promotes school readiness through education, health/nutrition, social/emotional, and family support services for local children age birth to 5 years who are income eligible. Community Action Head Start Program enrolls over 300 children in Orleans and Genesee counties annually. “We provide developmentally appropriate comprehensive services at licensed agency centers, licensed day care partners and in the homes of children and families,” said Bonnie Malakie, director of Children and Youth Services for Community Action. The “Sweet Cheeks” Diaper Drive is being supported by over 40 local business entities in the two counties over the next two months. Customers, employees and the public are asked to donate disposable diapers (any size) and/or baby wipes in hampers at these locations. These donations will help off-set the cost of supplies utilized in the Head Start program and will count as part of the local match required by the funders. Business or nonprofit entities interested in helping local young children may sponsor a Sweet Cheeks Diaper Drive donation hamper by contacting Barb Shine, Community Action Board member at 716-474-4459. Look for the hampers at your local businesses and organizations. Individuals interested in dropping off a package of disposable diapers/wipes may take donations in Orleans County to 401 East State St., Albion or in Genesee County at 5073 Clinton Street Rd., Batavia. Look for the containers as you enter the lobby. 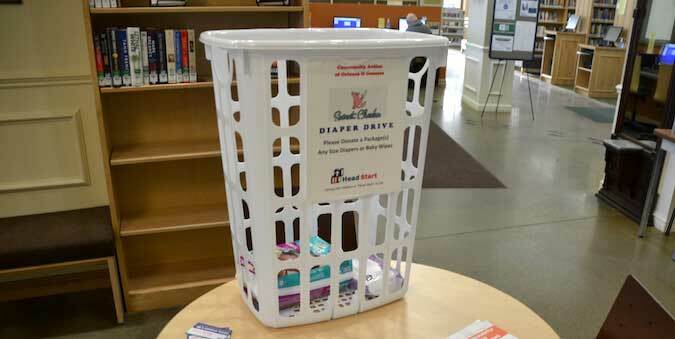 Photo by Tom Rivers: A hamper to collect diapers is set up at Hoag Library in Albion. 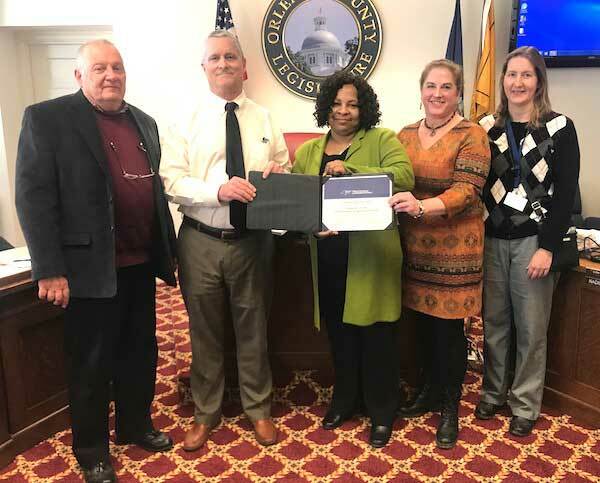 ALBION – The New York State Office of Temporary and Disability Assistance has recognized Orleans County’s Job Development Agency and the Department of Social Services for the county’s success in transitioning people from public assistance to securing employment. The county was honored for its success from 2015 to 2018. Pictured form left at last week’s Orleans County Legislature meeting include, from left: Fred Miller, county legislator and chairman of the Economic Assistance & Opportunity Committee; Tom Kuryla, DSS commissioner; Darcell McDonald, Temporary Assistance Specialist 1 in Employment & Income Support Programs, NYS Office of Temporary and Disability Assistance; Kelly Kiebala, director of the Job Development Agency in Orleans County; and Lauren Kirby, Workforce Coordinator in the OC Job Development Agency. 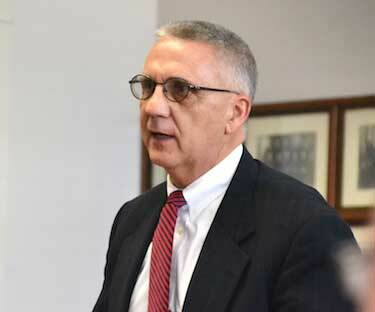 Photo by Tom Rivers: Orleans County District Attorney Joe Cardone speaks during Wednesday’s County Legislature meeting. ALBION – Orleans County District Attorney Joe Cardone said a proposed bail reform by Gov. Andrew Cuomo would turn people loose who have been charged with drug crimes and other offenses, putting the community at risk. Cuomo is pushing to eliminate cash bail and require the immediate release of people charged with misdemeanors and non-violent felonies, except those involving domestic violence or sexual offenses. The State Legislature also is considering proposals to eliminate cash bail. Legislation could be part of the state budget that is due to be adopted by April 1. Cardone said the governor and Legislature are pushing in the wrong direction, away from protecting victims and strengthening the criminal justice system. Cardone said the bail reform proposed would put many people who have been charged with crimes right back into the community, at a risk to their victims or others, especially informants who have aided in drug arrests. “It’s really not a thought-out position to do away with bail,” he said. Proponents of bail reform say cash bail is particularly difficult on poorer people, who are kept in jail for non-violent crimes when they pose little risk to the community. The state has been pushing other reforms, including having counsel at all arraignments. That will ensure the defendants always have an attorney to advocate on their behalf, including with setting bail, Cardone said. He said the governor and some state legislators are pushing for bail reform after some people lingered at the Rikers Island jail complex in New York City. But that isn’t the case in Orleans County, where Cardone said the bail is reasonable. The County Legislature also passed a formal resolution on Wednesday, opposing the bail reform. Legislators cited the concerns raised by Cardone and also said there would be a “significant financial impact” on counties, which would be mandated to establish and fund positions for “pre-trial agencies” that currently do not exist. Cardone and the county legislators also said Orleans could face big increases in extradition costs if judges can’t set bail and defendants flee the area and don’t return to court. Cardone said the county currently does about two or three extraditions a year, with officers going to other states to bring defendants back to face charges in Orleans County. “There is extreme concern over the cost of extraditions,” Cardone said. ALBION – The Orleans County Legislature has opposed the state’s push to expand the “Bottle Bill” which would add a deposit to sports drinks, energy drinks, fruit and vegetable beverages, and ready-to-drink coffees and teas. County legislators on Wednesday said that expansion would likely hurt the recycling program which is picked up weekly through the garbage collection program. The expanded Bottle Bill could remove as much as 50 percent of valuable plastic and aluminum containers from the recycling stream, legislators said. Instead of the expanded Bottle Bill, the County Legislature urged Gov. Cuomo and the State Legislature to add a deposit for additional glass beverage containers, including wine and liquor bottles, hard cider bottles, and non-alcoholic class beverage containers. Those items cause problems in the recycling stream due to breakage and contamination of other recyclables, county legislators said. Photo by Ginny Kropf: Key players in the leadership of United Way of Orleans County discuss ways to move the organization forward in the coming months. From left are board president Ellen Eaton, new executive director Dean Bellack and former director and new board member Kaitlyn Delamarter. 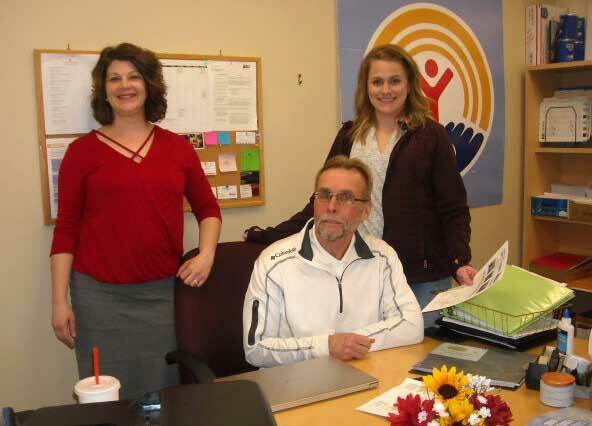 The new leadership at United Way of Orleans County are really not new at all – just rotating responsibilities. New leadership changes were precipitated by the transition of executive director Kaitlyn Delamarter from full time director to a position as board member. This came about after Delamarter announced in January she had accepted another position as marketing director for a local company. She also indicated she wanted to continue to be involved with United Way in some capacity. Delamarter, who has been director since December 2017, offered to be available to assist a new director, but also stated her interest in becoming a member of the board. At that same time, Dean Bellack of Medina had agreed to join the board at the suggestion of Dave Cook of Lyndonville, a longtime member of the board. After attending a meeting and learning the board would be searching for a new director, he drafted a letter in which he stated his credentials and what would be his goals for advancing United Way of Orleans County. Bellack is a native of the Cleveland area who moved to Medina for a job in 1984. He met and married the former Carol Lindsay, daughter of Jim and Sally Lindsay of Medina. They have fraternal twins, and welcomed their first grandchild, a boy, three months ago. Bellack, a partner in C&C Marketing, had also just made the decision to retire, effective April 1, but knew he still wanted to be involved in the community. Bellack was chairman of the YMCA board for 10 years and was instrumental in helping them complete a more than $600,000 renovation through donations from all of Orleans County. He is active in Medina Lions, serving three terms as president and helping to grow their membership. Eaton said the board needs to push awareness of United Way in Orleans County and the aspect of giving. “A lot of positive things are happening all at once,” she said. Photo by Tom Rivers: Dr. Tom Madejski of Albion (left), who is president of the Medical Society of the State of New York, joins Paul Pettit, the Public Health director for the Health Departments in Genesee and Orleans counties, and sharing their concerns about legalizing recreational marijuana in the state. Pettit is also president of the New York State Association of County Health Officials. The two are speaking at Wednesday’s meeting of the Orleans County Legislature. ALBION – The Orleans County Legislature went on the record Wednesday in asking the state to hold off on legalizing recreational marijuana, saying there are many negative impacts to society, as well as financial hits to local governments if marijuana gets the state’s blessing. Two local health officials, who lead state-wide organizations, also said there are too many unknowns for New York to allow legalized recreational marijuana. 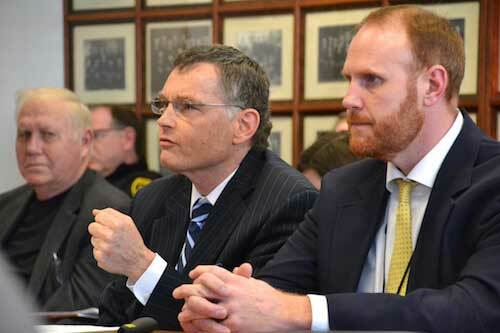 There will be impacts with more impaired drivers, likely leading to more serious motor vehicle accidents, Orleans County legislators were told on Wednesday by Dr. Tom Madejski and Paul Pettit. Madejski of Albion is president of the Medical Society of the State of New York. Pettit is the Public Health director for the Health Departments in Genesee and Orleans counties. He also leads the NYS Association of County Health Officials. They said legalizing marijuana will likely lead to more use among teen-agers and young adults, and that use at a young age makes them far more likely to develop drug addictions, the two said. “If this goes badly we’ll damage another segment of society,” Madejski told county legislators. He has helped lead the Medical Society of the State of New York’s response to the opioid epidemic, which Madejski said started about 20 years ago when opioids were pushed for pain relief, only to become highly addictive for many people. “We don’t need more intoxicants in society,” he said. Gov. Andrew Cuomo and the State Legislature have been debating legalizing recreational marijuana. County Legislator Don Allport, R-Gaines, said the push for legalization is a money grab by the state, which wants to tax marijuana sales. Proponents of legalizing recreational marijuana say it will take marijuana out of the black market. However, Madejski and Pettit said the black maret will continue to thrive because marijuana will be available without a big tax likely to be imposed by the state, making it more expensive. Pettit said the state needs to fund a public education plan about the dangers of marijuana use, if it is legalized for recreational use. He worries that children will be exposed through second-hand smoke or through edible marijuana that may be left around a house and appear to be candy or cookies. Pettit said today’s marijuana is highly potent. “These aren’t your grandma’s brownies,” he said. Several organizations are opposing recreational marijuana in New York include the Medical Society of New York, NYS Parent Teachers Association, NYS Sheriffs’ Association, NYS Association of Alcoholism and Substance Abuse Providers, Association of School Business Officials, and Smart Approaches to Marijuana. • Some of the ways of using marijuana include combusted products (joints, pipes, bongs, bowls, blunts and splits); vaporizers (electronic vaping devices); edibles (brownies, cookies and candies); drinks (elixirs, syrups and hot chocolates); and dabbing (using concentrates and waxes). • The use of e-cigarettes among youth and young adults increased 900 percent from 2011 to 2015 among high school students, Pettit said, citing the surgeon general. E-cigarettes grew 78 percent from 2017 to 2018 among high schoolers. There are currently 3.6 million youth in the US using e-cigarettes. • Pettit said evidence shows long-term use of marijuana can lead to addiction. There is recognition of cannabis withdrawal syndrome, which makes cessation difficult and contributes to relapse. Adolescents are particularly susceptible, compared to people who start using cannabis as adults. Those who begin using marijuana in adolescence are 2 to 4 times as likely to have cannabis dependence within two years after first use. • The use of cannabis in adolescence could influence multiple addictive behavior in adulthood, he said. District Attorney Joe Cardone was at Wednesday’s meeting and he shared concerns about marijuana becoming more accepted, even legal. • Weekly or more frequent cannabis use by adolescents and young adults is associated with impaired learning, memory, math and reading achievement, even 28 days after last use, Pettit said. Marijuana use is strongly associated with failure to graduate from both high school and/or college, he said. • County legislators, in stating their opposition to legalizing recreational marijuana, said more research is needed on the long- term health outcomes of marijuana use. • There will also be an impact on law enforcement agencies, which will need approximately 650 more drug recognition experts to determine if drivers are impaired by marijuana. • Legalizing regulated marijuana also will necessitate retiring a large majority of police K-9 dogs that are trained to detect marijuana, as their detection capabilities would no longer be admissible in court and the replacement of these K-9 officers could easily take 5-7 years at great cost to taxpayers, legislators said. Legislator John DeFilipps, R-Clarendon, said the push by the state is contrary to decades of messages about the dangers of using drugs. Legislator Allport said the state shouldn’t legalize marijuana. ALBION – The Orleans County Legislature approved a new three-year contract on Wednesday with 60 workers in the Orleans County Sheriff’s Employees Association. They will be getting 2 percent annual raises from the years 2019 to 2021. The union represents correction officers, jail cooks, civil clerks and dispatchers. The contract includes a new high deductible health plan and new employees need to contribute 20 percent of their health insurance costs. Veteran employees tend to pay 10 to 15 percent of the health insurance costs, depending on their length of service. The contract also calls for shifts at dispatch to be re-bid. The previous contract with the union from 2016 to 2018 also provided for 2 percent annual raises. ALBION – Orleans County legislators today formally opposed the Red Flag Bill, which was signed into law by Gov. Andrew Cuomo on Feb. 25. The legislation prevents individuals who show signs of being a threat to themselves or others from purchasing or possessing any kind of firearm. Cuomo touted the bill last month as the first in the United States to empower teachers and school administrators to prevent school shootings by pursuing court intervention. No law previously existed in the state that enabled a court to issue an order to temporarily seize firearms from a person who is showing red flags, like violent behavior, or is believed to pose a severe threat of harm to himself, herself, or others unless that person has also been accused of a crime or family offense, Cuomo said. County legislators said a better way for the governor and State Legislature to respond to gun violence is to increase penalties for criminals who use firearms to harm or threaten law-abiding citizens, and also to address the issues of mental illness related to violence. The County Legislature’s resolution will be forwarded to state legislators and the governor. File photo by Tom Rivers: Skip Draper takes the oath of office on Dec. 28, 2017 when he was sworn in as an Orleans County legislator. ALBION – The Orleans County Republican Party officially has a new leader. Skip Draper was picked unanimously to serve as the party chairman on Saturday. He succeeds Ed Morgan, who served in the role for 12 ½ years. Morgan resigned on Jan. 24. Draper stepped in as acting chairman. The party’s bylaws give the GOP Committee up to 60 days to choose a successor. The committee, which has 80 members, met on Saturday morning and picked Draper for the job. Draper had been serving as vice chairman. That spot will now be filled by Michael Mele of Murray, who is the chief deputy for the Orleans County Sheriff’s Office. He is also chairman of the Murray Town Republican Committee. Draper is in his first two-year term as an Orleans County legislator after getting elected in November 2017. 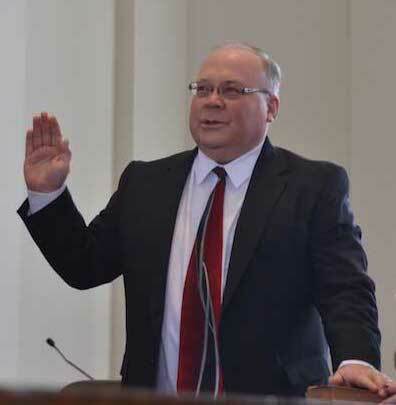 Prior to that he served 24 years as the Shelby town supervisor. His goals are “to keep the party unified and together.” He said his role is to keep party finances sound, and to have quality candidates seek positions at the village, town and county level, as well as for state and federal positions. This year the election calendar has moved up with local and state primaries now aligned with the federal schedule. That means candidates are circulating petitions for a June 25 primary, instead of one in September. Those petitions are due next week at the Board of Elections. A primary is expected for county sheriff with current Undersheriff Chris Bourke and Rochester Police Sgt. Brett Sobieraski seeking the position. Randy Bower, the current sheriff, isn’t seeking re-election. Other primaries also are expected at the town level. ALBION – The Orleans County Legislature next week will name John Papponetti the county highway superintendent, according to the agenda for the meeting on Wednesday. Papponetti, a former Albion resident, works as an engineer for Labella and Associates. He will also serve as the county’s engineer. He is to be appointed during the Legislature’s 4:30 p.m. meeting on March 27. He will succeed Jerry Gray, who retired as highway superintendent on Dec. 30. Papponetti grew up in Albion and served on the Village Board when he was in his 20s. His father Harry is the Albion fire chief. Papponetti has worked closely with the County Highway Department in recent years doing an inventory of the conditions of county bridges and culverts. He also worked with the department last year when it poured the concrete slabs and constructed a culvert on Culvert Road in Ridgeway. That was the first time the highway department did that kind of project by itself. It reduced the construction costs by an estimated $180,000. Peter Houseknecht, the deputy highway superintendent, has been acting superintendent since Gray retired. Houseknecht joined the county after serving as the superintendent of the Village of Medina DPW. Johnson said Papponetti and Houseknecht will be a great team leading the department. 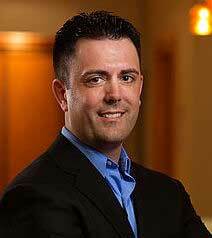 In 2014, Papponetti was honored by the Rochester Engineering Society as the “Young Engineer of the Year.” He has worked the past 15 years with Labella and Associates. He is the past president of the Association for Bridge Construction and Design, Western New York chapter. Papponetti will receive an additional $20,500 stipend to serve as the county engineer. Having him on staff will save the county an estimated $70,000 in engineering expenses, said Chuck Nesbitt, the county’s chief administrative officer.